I generally don’t read many non-fictional books, which is why the idea of reviewing Super Women did not seem too appealing to me. However, when I received the book I was intrigued by the idea of getting a peak into the journey of 20 successful women entrepreneurs. The beautifully designed cover page in fact, helped in enhancing my interest as it gave the impression of opening the doors an interesting saga of learning and enlightenment. 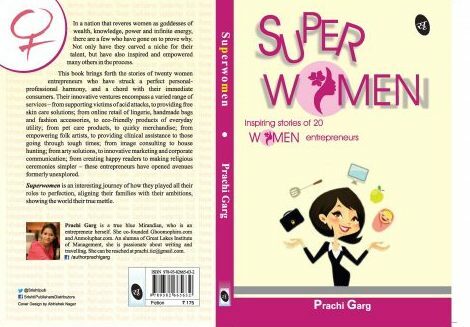 Super Women, has been penned by Prachi Garg, who is herself is an entrepreneur and is also a passionate writer. The book tells the tale of 20 women who made it big in a man’s world while creating a perfect balance between their personal and professional lives. These women, whose innovative enterprises offer a wide range of services to the clients, have managed to dared to venture into an arena that was considered forbidden territory for females. The book narrates the tale of their success while also highlighting the efforts these women had to make to play the various roles expected of them to perfection and show their true capabilities to the world by managing their families and their ambitions in a well-coordinated manner. Prachi Garg has chosen the women featured in her book on the basis of the common ideology that they share, namely the intent to do something big and unique which can help bring about a positive change in the society. The author has done ample research and conducted several interviews to bring to fore the challenges that these women faced in their journey of success and the methods they adapted to overcome the same. The book is a celebration of success attained through pure will and determination and is surely a great motivational read for everyone, especially females who want to do something extraordinary. I wish Prachi all the success for her superbook.